The concept is suspended metamorphosis. The sculpture represents the chrysalis for us as artists as well as people in general. This outer shell is suspended quite literally and also figuratively in that we believe transformations in ourselves and others are currently taking place with the end result yet to be determined. In conjunction with the visual aspect to this installation, there is an additional 4-channel fixed media sound art composition. The sound art is composed from the recorded sounds of frogs and local elementary school students singing a song about butterflies and frogs. The sound art invokes a sense of change and transformation aurally as well as visually and is accessible for free download and streaming to a mobile device through a QR code on site. The sculptures are externally light by solar powered, color-changing LED flood lights. The colored light interacts with the painted facets of the sculptures to produce dramatic visual effects. The sculptures are 8' tall x 3' x 3' and are suspended within 10' x 10' x 10' steel frames. 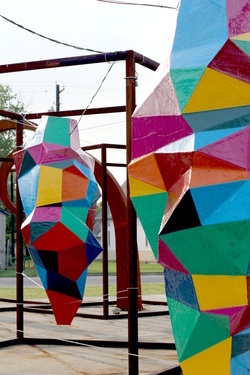 This installation is located in Bryan, TX. Chrysalis 1 and 2 from Owens and Crawley on Vimeo.